HungaroControl Pte. Ltd. Co. is the organisation appointed by law to provide air navigation services in the Hungarian airspace, and to train air navigation personnel. Our mission: Providing save and efficient air navigation services. HungaroControl Hungarian Air Navigation Services was founded on 01 January 2002, as an economically independent budgetary institution, which took over the task of providing air navigation services in the airspace of Hungary, and on its designated airfields, primarily on Budapest Liszt Ferenc International Airport. As a result of its transformation into a business organization, and the termination of the former budgetary institution, from 1 January 2007 HungaroControl Hungarian Air Navigation Services Pte. Ltd. Co. fulfils its statutory obligations in the form of a single member private limited company. With the establishment of HungaroControl Pte. Ltd. Co., Hungary adopted the system of threefold separation commonly used in air transport all over the world, which means that not only the air carrier, but the operator of the airport and the national air navigation service provider became independent companies. Over 700 of our employees work to ensure the uninterrupted safety of flight and airspace. Our aim is to stand for a high quality professional service, while maintaining environmental awareness. Being an integrated (civil and military) air navigation service provider, HungaroControl Pte. Ltd. Co. guarantees the safety of all aircraft operated in accordance with the rules of general air traffic, ranging from aircraft departing or landing at Budapest Liszt Ferenc International Airport to overflying traffic in upper airspace. In terms of figures this means that our air traffic controllers direct 1700 aircraft on average per day from the Budapest Air Control Centre and the control tower, using the latest technology. Throughout our operations flight safety is of absolute priority, but we also take into account the interests of society as one global unit. We constantly improve the quality of our services and the level of safety in the light of social and environmental issues. Ab-initio training and air traffic controller refresher courses are provided on the 3D and high-fidelity Radar simulators manufactured by Adacel, Inc. of Canada. The high-fidelity 3D tower simulator provides a realistic, 180° display of the view from an aerodrome control tower. The system database currently contains 6 airport layouts: Airosar (EXAS), a synthetic airport developed in line with Eurocontrol recommendations for use during Ab-Initio Rating training, Budapest-Ferihegy (LHBP), Sármellék (LHSM) and Debrecen (LHDC) airports, and the Hungarian military airbases of Kecskemét (LHKE), Szolnok (LHSN) and Pápa (LHPA). The addition of any other airport layout is possible on demand. The Tower simulator is used for Ab-initio Rating training as well as the annual refresher training in emergency situations and professional skills for active air traffic controller and flight information service personnel. 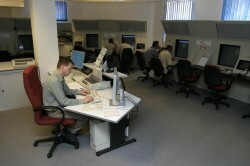 In addition to a realistic representation of any weather phenomena and aircraft flight and emergencies, the system simulates the operation and function of the air traffic controller equipment at the control tower of Budapest Ferihegy Airport, which presents an opportunity to provide pre-On-the-Job training for student air traffic controllers. The up-to-date Voice Recognition system allows the flexible scheduling of simulations and represent a valuable asset in training especially Ab-Initio students to use approved standard phraseology. The Radar simulator is also available for experimental simulations preceding the introduction of new airspace structures or air traffic control procedures. 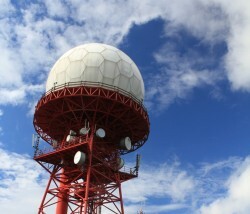 Basic radar skills are trained on the Radar Skills Trainer operated under a license agreement with the Eurocontrol Institute of Air Navigation Services. The program is manufactured by Graffica, Ltd. of Britain. This reliable system allows the acquisition of some basic radar control skills and enables instructors to closely monitor and record the progress of students. An Instrument Flight Training Device (IFTD) is available to demonstrate in-flight procedures and workload. Ab-Initio students receive a 20-hour training course in radio navigation and instrument flight procedures. The device is also available for external customers undergoing CPL training as the Regulatory Authority recognizes a 10-hour simulator course as actual flight hours. General Information: The Flight Profile Generator is one of the outcomes of a several years’ development-research cooperation of HungaroControl Hungarian Air Navigation Services Pte. Ltd. Co. and Budapest University of Technology and Economics, an academic institution with a great past. The objective of the company and the institution was to develop a software which allows a comprehensively utilizable, precise and spectacular flight process demonstration. The Flight Profile Generator can be successfully applied in ab-initio air traffic controllers’ training as well as in operational air traffic controllers’ periodical refreshment training, since, by means of this, certain conflict situations or incidents can be spectacularly and professionally analysed. By using the archive signals recorded by radar stations as initial data, the software constructs the route of one or more aircraft by taking their aerodynamic features and flight capabilities into account. Based on the flight profile developed in this way, the program calculates the values indicated by the major on-board instruments at that time, and moreover it is capable of reading and processing S-mode recorded data. Then, adjusting to demands, the information can be displayed on a graphical interface depending on the purpose of either supporting an incident investigation, or training air traffic controllers, or informing media. Due to the graphic display of modelling it can be precisely represented how aircraft have responded to an instruction, how an air traffic situation has evolved, how aircraft have been positioned in relation to one another, or what instruction the on-board T-CAS equipment has issued, etc. By the mathematic model of the software the natural inaccuracy of the signals provided by radar devices can be greatly reduced. The system is capable of reading and processing S-mode recorded data. The program is capable of a very spectacular representation of routes taken by flying aircraft or their moving on the ground allowing, if needed, the display of major on-board instruments and the recorded voice communication of radiotelephony related to the movements. The program offers several additional functions to be viewed such as the display of the sight an air traffic controller can see from the control tower among various weather and light conditions but the representation of ground movements can be also integrated in the system if a Ground Movement Surveillance System is available. Due to its high level graphic elaboration it provides the representation of several aircraft types of a great number of airlines just like the view of a high quality aircraft simulator.